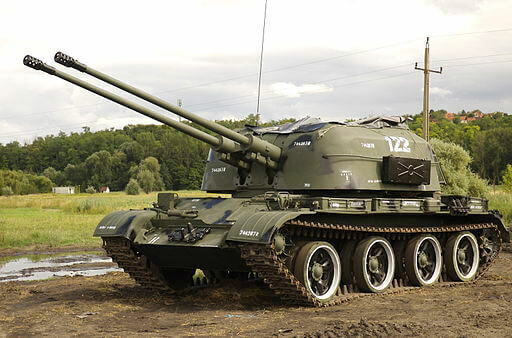 The ZSU-57-2 entered service in 1955, providing the Warsaw Pact armies with a self-propelled anti-aircraft gun that could accompany the advancing armies. The hull is based on a lightened T-54 chassis. The armour is much lighter and it has four road wheels instead of the T-54’s five. Two air-cooled 57mm S-68 guns are fitted in a large, boxy, open-topped turret. 300 rounds of ammunition are carried, in a mix of armour-piercing, fragmentation-incendiary, and fragmentation, all of which had tracer. A tarpaulin cover is provided for protection against inclement weather. The turret has powered traverse and elevation. Unlike the later and more successful ZSU-23-4, the ZSU-57-2 has no radar. This effectively means that it’s use is limited to clear weather conditions. It has optical sights (initially with no rangefinder, though a rangefinder was later added), which are configured to allow use in a secondary role as a ground support vehicle. Maximum effective range of the guns is around 4,000m. Armour thickness is between 8 and 15mm, and the vehicle has a top speed of 31mph, with a range of 260 miles. Obviously, this is the last of the AFV Alphabet series. It was interesting to research and write, I hope it was also interesting to read. My thanks to Tim Gow for the inspiration.